Ms. Julia Song, a 2015 Occupational Therapy Assistant graduate of cohort OTAFT008, was recently awarded the Thomas A. Fuentes Community Service Award at the Stanbridge College Commencement Exercises. The award recognizes a graduate who excels in giving back to our community by making a significant impact on the lives of those in need. Ms. Song has taken to heart one of the key focuses of the OTA program, the promotion of mental and physical health, through a commitment to serving her community. 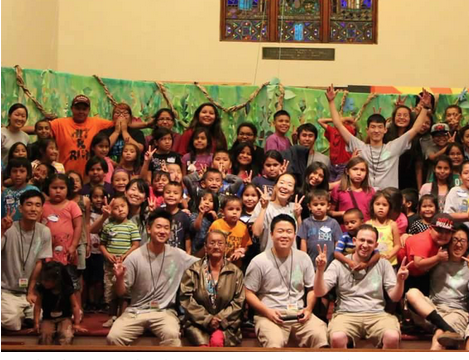 She has been a leader on several mission trips to the Navajo Native American Reservation in Arizona through Sae Han Presbyterian Church, helping with construction work and organizing arts and craft events for the young people and their families. To her, community service serves as a reminder of why she chose Occupational Therapy as her career – to motivate those around her through love, faith, and service. “My commitment to community service is to make it a lifestyle; I considerate it necessary to become and remain a successful therapist. The idea of sacrificing my time and abilities in the name of love and faith will shape me to be a therapist that does not do her job for monetary gain but for satisfaction in serving others. This mindset will keep me mentally strong so that I can be the rock that my patients lean on, no matter what.” Ms. Song exemplifies the qualities of servant leadership Stanbridge College strives to instill in its graduates.